Crimes committed: why are no bankers in jail? How nice of you: that gift you just made to charity. No one asked you if you wanted to make the gift. No one asked you which charities you’d want to support. But still. You made it. So thanks. Well done. If you’re confused – if, by chance, you don’t remember authorising anyone to pick your pocket to give to charity – then welcome to the world of financial services. Here’s how it works. Greedy, irresponsible morons on huge salaries and inflated bonuses take RBS, one of Britain’s leading banks, and trash it to the point of insolvency. 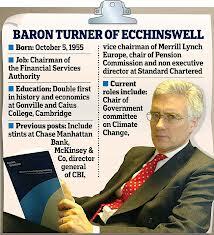 Lord Turner should resign immediately giving his pension to taxpayers who bailed out RBS ! But the thing is, you own the bank. So that fine hits you. It doesn’t hit the idiots who managed the bank. It doesn’t hit the fraudsters directly responsible for the manipulation. Now although that’s hardly good news, it would be almost OK, as long the FSA simply returned the money to the Treasury, so that in effect you’d have been paying the fine directly into your own pocket. But that kind of common sense offends those in government. So instead the FSA passed the fine – the one which you paid – to charity. So you now have the rare privilege of (i) having shelled out for the costliest bank bailout in history with no chance of ever being repaid, and (ii) having given £87.5 million to charity. Well done. But the figure that really counts? The figure that really counts is zero: the number of bankers in jail as a result of all this mess. Oh, and curiously enough, that number is identical with the number of brain cells registering electrical activity at the FSA. It’s enough to make one weep. Once upon a time, people DID go to jail for this sort of thing. 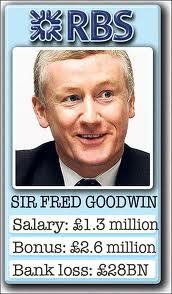 And it didn’t matter how high up you were – even a peer of the realm in the UK could be sentenced to hefty jail time. At least someone – Elizabeth Warren – is asking the question in the US. Whether something will come of this is doubtful – I wonder just how long she’ll actually last – I can’t see any of her Senate colleagues having the same enthusiasm. Needs an Eliot Spitzer to have the guts to bring the prosecutions. MF Global? Hmmm. Its up to us and Planet Ponzi tells a story everyone needs to hear! Jail time for people like Lord Kylsant. Clarence Hatry sentenced to the maximum of 14 years penal servitude – no open prisons for white collar criminals in those days. The thing that gets to me the most no one is accountable no one gets a prison sentence and guess what we are paying freddie’s pension. Sure, prices have never recovered. The stock market is still almost 75 percent below its peak and land prices are down 60 percent. After two decades of nearly stable consumer prices, the Japanese government is once again badgering the central bank to do something to create a bit of inflation.